*A very unusual day weather wise in the Silver Valley. 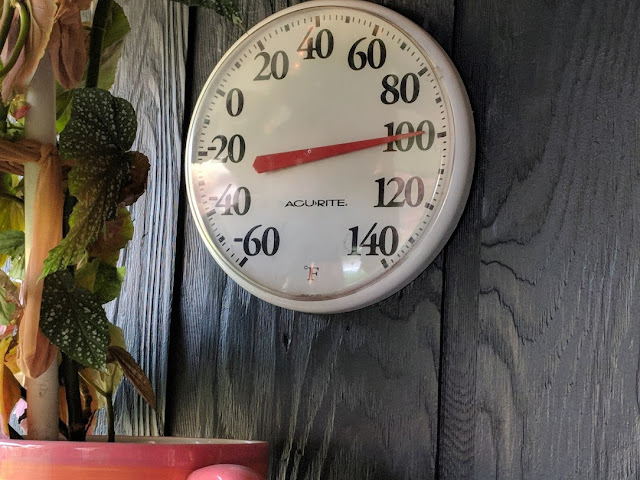 I took a photograph of the thermometer on our patio, which is in the shade and under cover, and it still registered 100 degrees at 6:30 p.m. I think the high was around 109 degrees yesterday. Yes, it was hot! *Things slowed down a bit at work today, which was nice after such a busy day yesterday. We still had over 100 people do the mine tour, but it was a much slower pace today. *Since it was still pretty warm inside the house, we moved the television out to the patio, and watched the movie The Miracle Season. It is the story of a high school volleyball team in Iowa who lost a teammate, and how they struggled through her death, but ended up champions in the end. I remember seeing the trailer to this movie last fall, and thought it would be a nice feel-good movie that Paul and I would enjoy. I was right. We cried our way through it all, as we were touched by the story of these young girls, and the obstacles they overcame. *After the movie was over, I stayed outside, enjoying the fact it was cooling off, and watched a few episodes of Chopped as well. *Molly and Travis departed today with their bunnies back to Moscow, to have a little down time before Travis starts classes back up at the University of Idaho, and Molly begins her semester of student teaching at the school she has been a para-professional for the past two years. I am so excited to hear about her experiences this semester, and watch her finish her final weeks to earn her degree and become a certified teacher. I am so proud of Molly, and I know she is going to be a wonderful teacher.